I'm not a big fan of winter at all. Truthfully I'm a huge baby about the cold. Winter desserts are one thing that makes the season that little bit more bearable don't you think? 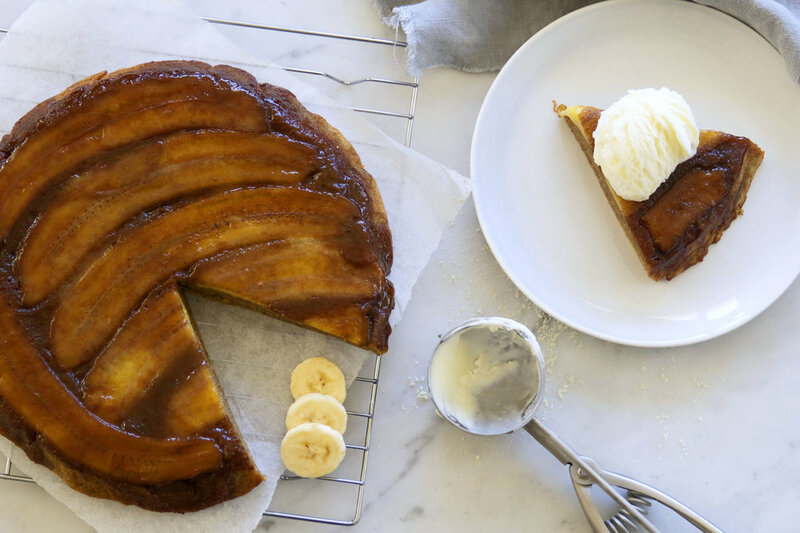 Served hot from the oven with cream or vanilla ice cream, this gluten free dessert pairs the goodness of fair trade bananas from my friends All Good Bananas with an indulgent coconut sugar caramel and the warm spice of ginger. If you've not yet aware of the compelling reasons to buy fair trade bananas, jump over to THIS section on the All Good Bananas website to have a quick read. This simple decision has benefits for the environment, provides a fair wage for the farmers growing them and also has wider benefits for the community the farmers live in. Every day the choices we make with our food dollars say something about the kind of world we want to live in. I just love that this one is SO simple. 2 ripe All Good bananas – mashed well. Combine the banana, egg, vanilla, sugar, baking powder, ginger, mixed spice and cinnamon in a large bowl. Whisk together well. Add the almond meal and tapioca flour. Stir with a wooden spoon. Finally, stir through the melted butter. Pour the melted butter for the topping into the bottom of the baking dish. Sprinkle the sugar evenly over it. Lay the sliced bananas in the bottom and pour over the cake batter. Use a spatula to smooth out the top. Bake for 22 – 26 minutes until a skewer comes out clean when inserted. Let the cake sit for 10 minutes before inverting onto a plate. Slice and serve with fresh cream of ice cream. Leftover cake can be stored in the fridge for up to 3 days. Gently reheat in the oven.